Before 1728: most likely born in Kamigata. He starts his career with his brother in countryside theaters, as disciples of Arashi Sangorô I. His stage name is Arashi Shichigorô I. 11th lunar month of 1728: Shichigorô plays at the Ônishi no Shibai; this is most likely his first stage appearance in ôshibai. 11th lunar month of 1730: Shichigorô plays as a wakashugata in Ôsaka in the kaomise drama "Kunkoku Ôe no Kôbai", which is produced by Asao Motogorô I. 11th lunar month of 1733: Shichigorô becomes katakiyaku and plays in Kyôto in the kaomise drama "Meotogura Kogane no Masugata". 1st lunar month of 1734: Shichigorô's rank in the Kyôto hyôbanki, katakiyaku section, is jô-jô-(shiro)hankichi (superior - superior - (white) half excellent). 11th lunar month of 1734: Shichigorô becomes jitsuaku and plays at Miyako Mandayû's theater the role of Sekiguchi Manzô in the kaomise drama "Tomi Yakata Kogane no Yaguruma". 1st lunar month of 1735: Shichigorô's rank in the Kyôto hyôbanki, jitsuaku section, is jô-jô-hankichi (superior - superior - half excellent). 11th lunar month of 1736: Shichigorô plays in Kyôto in the kaomise drama "Tomi no Ichi Kogane no Aratama", which is produced by Nakamura Tomijûrô I. His stage partners are Ichiyama Sukegorô I, Nakamura Shingorô I, Sakurayama Shirosaburô II, Yamanaka Heijûrô I, Sanogawa Mangiku, Yamashita Kinsaku I, Tatsuoka Hisagiku and Tatsuoka Someemon. 1st lunar month of 1737: Shichigorô's rank in the Kyôto hyôbanki, jitsuaku section, is jô-jô-kichi (superior - superior - excellent). 1st lunar month of 1739: Shichigorô plays in Kyôto at Kameya Kumenojô's theater the role of Kantetsu and Ishidô Hyôbu in the drama "Keisei Arashiyama", which is produced by Nakamura Tomijûrô I. 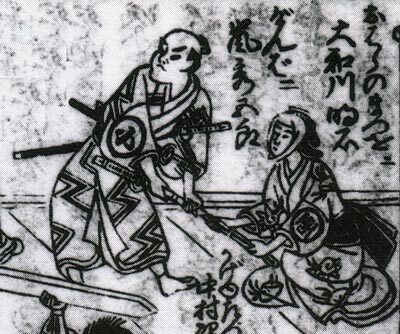 Fall 1739: Shichigorô goes to Ôsaka. 12th lunar month of 1739: Shichigorô plays at the Ônishi no Shibai the role of Fuwa Banzaemon in the drama "Kewai Musha Ômi Genji", which is produced by Yoshizawa Ayame II; his stage partners are Yoshizawa Ayame II (Okichi), Nakamura Sôjûrô (Shôgen), Sakakiyama Shirotarô I (Nagoya Sanza), Anegawa Shinshirô I (Matahei) and Segawa Kikunojô I (the courtesan Tôyama). 11th lunar month of 1740: Shichigorô plays at the Ônishi no Shibai in the kaomise drama "Yaguruma Yakata no Fuji", which is produced by Nakamura Tomijûrô I; his stage partners are Yamamoto Kyôshirô I, Nakamura Shingorô I, Nakayama Shinkurô I, Sanogawa Mangiku, Segawa Kikunojô I, Onoe Kikugorô I and Nakamura Sôjûrô. 11th lunar month of 1741: Shichigorô plays at the Ônishi no Shibai the kaomise drama "Bankoku Taiheiki", which includes the "Uirô Uri" scene and stars Ichikawa Ebizô II, Ichikawa Danjûrô III, Yamamoto Kyôshirô I, Sadoshima Chôgorô I, Onoe Kikugorô I, Yamashita Kinsaku I, Nakamura Jirôsa I, Bandô Toyosaburô I, Shibazaki Taminosuke, Yamanaka Heijûrô I and Yamatogawa Akashi. 1st lunar month of 1742: premiere at the Ônishi no Shibai of the play "Narukami Fudô Kitayama Zakura"; Shichigorô plays the role of Yatsurugi Genba [casting]. 11th lunar month of 1743: Shichigorô plays at the Ônishi no Shibai in Namiki Sôsuke's kaomise drama "Futatsu Biki Nishiki no Manmaku", which is produced by the zamoto Nakamura Jûzô I; his stage partners are Sawamura Sôjûrô I, Nakamura Tomijûrô I, Sanogawa Mangiku, Sakurayama Shirosaburô II, Nakamura Shingorô I and Iwai Hanshirô III. 9th lunar month of 1745: Shichigorô plays the roles of Yakanpei and Shôgen in the drama "Ashiya Dôman Ôuchi Kagami" , which is produced by Nakamura Jûzô I at the Ônishi no Shibai; his stage partners are Bandô Toyosaburô I (Abe no Yasuna), Nakamura Jûzô I (Dôman), Nakayama Shinkurô I (Yokanpei), Ichikawa Danzô III (Sakon Tarô) and Yoshizawa Ayame II (Kuzu-no-Ha). 12th lunar month of 1745: the drama "Natsu Matsuri Naniwa Kagami" is performed for the first time in Ôsaka, simultaneously in the three major theaters of the city, which starts a competition for the best performance; Shichigorô plays the role of Danshichi Kurobê at the Naka no Shibai [casting]. 11th lunar month of 1750: Shichigorô plays at the Kado no Shibai in the kaomise drama "Tachibana Gojûyongun", which is produced by Iwata Somematsu I; his stage partners are Ichikawa Danzô III, Bandô Toyosaburô I, Yoshizawa Sakinosuke II and Kirishima Gizaemon I. Fall 1751: Shichigorô goes to Edo. 11th lunar month of 1751: Shichigorô plays at the Ichimuraza the role of the painter Matahei, in reality Ômi no Kotôta, in the kaomise drama "Kamimukae Nigiwai Genji", which celebrates the shûmei of Bandô Hikosaburô II. 1st lunar month of 1752: Shichigorô's rank in the Edo hyôbanki, jitsuaku section, is jô-jô-kichi (superior - superior - excellent). 11th lunar month of 1752: Shichigorô plays at the Ichimuraza the role of Adachi Hachirô in Tsuuchi Jihê II's kaomise drama "Ume Sakura Ninin Semimaru". 1st lunar month of 1753: Shichigorô's rank in the Edo hyôbanki, jitsuaku section, is dai-jô-jô-kichi (grand - superior - superior - excellent). He plays in the same theater the role of Kajiwara Heizô Kagetoki in the new year drama "Haru Fukami Iroha Soga". This is his last recorded performance. What happens to him afterwards is unknown. Arashi Shichigorô I was a talented actor, who achieved fame for himself during the first half of the 18th century as a jitsuaku actor. He made most of his career in Kamigata but ended it with a short and successful stay in Edo. He was said to be better in jidaimono rather than in sewamono.